Last year, Congress chief minister Digvijay Singh lost the Madhya Pradesh (MP) state elections. Two years before, the Communist-led coalition lost in Kerala. Since both governments had fervently promoted decentralisation, questions naturally come to the fore: Was their defeat a vote against the move towards local governance and devolution of power? Further, if decentralisation does not bring electoral benefits, will politicians invest in this idea in the future? What went wrong in MP? What's not going right in Kerala? In MP, will the initiatives introduced outlive the change in government? In Kerala, has it outlived so? Once people have tasted power can officialdom regain its control once again? Or are we wrong to believe that officialdom's stranglehold had been loosened? In this story, we attempt to find answers. But before you read what we found, let us make clear to you a bias. Down To Earth has consistently upheld the idea of a devolved state, in which local institutions are empowered to manage their resources and other affairs. Not because of religious or other sentiments, but because we know that bureaucracies cannot plant trees that survive, or build and maintain local water systems, or protect grazing lands from encroachments, or run schools where teachers come to work. Bureaucracies cannot achieve all this in the 600,000 villages of India and its numerous hamlets. At the same time, if people are to participate, they need institutions. They need funds to spend on what they think is their priority. They need legal entitlements. Readers of Down To Earth may recall that in 1998, it was widely predicted that Digvijay Singh would lose. But he won. We reported then that 'good governance' had paid dividends. The swing of votes was highest in the tribal constituencies; water and education programmes had obviously impacted. In 2003, Congress' vote share fell from 40.6 per cent (in 1998) to 31.8 per cent. The swing was marked in the same tribal belt. The BJP picked up 36 of the 41 reserved seats for scheduled tribes, making inroads into rural areas on the whole. Down To Earth reporters found a complicated scenario, perhaps much more than what unfolds here. But one fact is crystal clear: decentralisation is weaving a new magic -- confident and effective local leaders, water in local tanks, teachers in schools. But still people resent the man and the government that promoted these programmes. There seem to be no real takers for the 'idea' of decentralisation. We are not very surprised. This is because it involves devolution of finances. And it means decentralisation of power. The politician serious about such devolution will fall foul of the system at all levels -- village, district and state level functionaries, and people's representatives. Everybody likes decentralisation, but only up to their level. This is especially true of a country where corruption is a tidal phenomenon, where pelf, privilege and pilferage are the ways of the political process and the administration. This is what happened in MP. Digvijay Singh invested in innovative and fascinating institutional changes but he also succumbed to the pressures working against decentralisation. For instance, in 2001 he enacted the Madhya Pradesh Panchayat Raj (Sansodhan) Adhiniyam (or the Gram Swaraj Amendment), which deepened democracy by making the gram sabhas (village assembly) the constitutional authority for governance. He did this to break the nexus of the "sarpanch raj. He earned their ire and then had to delay implementation. In this process, the elected sarpanch and panchayat members worked against the gram sabha, making them pawns for government petty officials. Furthermore, he gave in to elected representatives -- MLAs and ministers -- by making them members of the district planning committees or zilla sarkar. He also appeased officialdom by making the collector (district level bureaucrat) the member secretary of the district government, responsible for preparing a draft development plan for the district as a whole. The rules for consolidating the programmes prepared by the panchayats or gram sabhas were never formulated. Similarly, while the District Rural Development Agency (DRDA) was merged with the zilla panchayat, centrally sponsored schemes were not brought under the ambit of this local body. Thus, the bureaucrat continued to control funds and administrative decisions. But elected representatives, now literally naked to public scrutiny, suffered. Local leaders had to deal with the same horrible system and told Down To Earth how they had to make many trips to government offices and how they would "have to pay" to get their programme sanctioned. Kerala's story is similar. In 2000, when Down To Earth had reported on the People's Plan Campaign, it was dynamic and bold. Government would devolve 40 per cent of state funds to local agencies; the state budget and plan would emerge from a collective of village level plans. A year later, government changed and the elected Congress-led coalition promised to keep the programme alive. Now, many see cracks emerging. An acute fiscal crisis has forced the government to negotiate a loan with the Asian Development Bank (ADB). The programme includes the 'modernising government programme' component, which will revamp state and local institutions for more effective delivery of services. There are reports in the local media on corrupt local panchayats, and how ineffectively they implement programmes. Changes are being made to existing guidelines, that could dismantle the intent -- if not the form -- of decentralisation here. The reforms are geared to downsizing the state. In this system, the local panchayat is a mere service-providing body, more effective than the state authority. What will this do to the character of institutions that are meant to deepen 'the state', only time can tell. But it is evident that the state bureaucracy, which opposed the very thought of devolution since its inception, will now find circumstances are more suitable to mould the programme closer to its interests: an adjunct department, not an autonomous institution capable of self governance. In both states there are parallels: Firstly, a stronger gram sabha is resented. Politicians find it easier to promote representative democracy and view the village assembly as pliable to bureaucratic interference. The transparency and accountability the gram sabha provides is not appreciated. Secondly, the Fifth Pay Commission -- which increased salaries and allowances of government employees -- has crippled state economies; empty treasuries cannot fund devolution. In addition, assistance to states from the Centre has decreased, from 52 per cent in the Eighth Five Year Plan to 45 per cent in the Ninth. States are forced to borrow more to survive. Now, if they were to decide to share revenues with decentralised agencies or people, they would be even worse off. For instance, the MP government has said that its programme to distribute the proceeds of its minor forest produce directly to people would mean an annual loss of Rs 100 crore to the state exchequer. Thirdly, it is clear that politicians will have to be capable of "working" their bureaucracies and not be "worked by" them. Decentralisation is a serious and difficult business. It will take time, require institutional innovation. It demands support against all odds. That kind of backing, Down To Earth found out, was pathetically weak. Digvijay Singh's biggest failure was his inability to convince his colleagues. His own party, which had brought in the 73rd Amendment to the Constitution giving powers to local agencies, was not willing to stand behind it or "sell" this example of shining India. 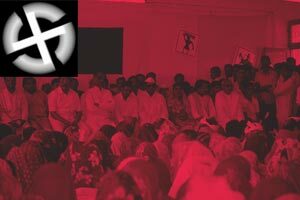 Similarly in Kerala, the Left-front has been working overtime to abuse the proponents of the People's Plan as agents of "imperialist powers", saying the programme promotes non-ideological democracy. Most of all, this failure belongs to all of us, particularly the media and academia. The governance-related innovations of MP and Kerala need to be understood, so that they can be replicated or amended. This learning ground for democracy demands careful and continuous scrutiny. This is where we have erred. We have not participated adequately in the great experiment. The issue is not if Digvijay Singh lost or if Uma Bharati won. The only winner is the bureaucracy. The losers are all those who want change. This is the laboratory of development. In Kerala's Kozhikode district, there exists a village that doesn't depend on government dole: Olavanna's panchayat has been successfully running its own drinking water project since the 1990s. This is completely unlike the way the United Democratic Front (UDF) government functions. The Kerala Rural Water Supply and Sanitation Agency (KRWSSA), for instance, has borrowed Rs 300 crore from the World Bank to finance a Rs 450-crore drinking water and sanitation project in 80 panchayats. Loans have also been taken from other foreign institutions for roads, power and reforming governance. A Madhavan, president of Eramiyur panchayat in Palakkad district, also can't go the Olavanna way. "The World Bank (drinking water) project has already started here," Madhavan says sadly. "Tell me, how can they forget Olavanna?" asks A S K Nair, of the Centre for Earth Science Studies, Thiruvananthapuram. "Olavanna has become a metaphor for governance. Why hasn't Olavanna been replicated is a question being asked with increasing urgency today." On December 17, 2003, the state planning board (SPB) announced that rural water supply schemes would be handed over to panchayats. But Madhavan and other panchayat leaders weren't impressed. "The biggest problem is local bodies don't want to take up water schemes because there are no clear guidelines," says V Ramachandran, vice-chairperson of SPB. Out of 1,053 water bodies selected, only 166 have been transferred. Why? Panchayats allege the government's policy on managing water bodies is blind "The Kerala Water Authority selected schemes without consulting local government bodies. Most of these schemes are not working," says P Kamalkutty, secretary, local self-government (LSG) department, Thiruvananthapuram. When people protested, the Kerala Water Authority (KWA) decided to 'rehabilitate' the schemes and give them to beneficiary groups of panchayats. "The KWA is unable to run these schemes. How do they expect the panchayats to do so?" asks Nair. The confusion doesn't end there. "The KWA was set up as an autonomous agency in 1986 to centralise water distribution. Now KWA has been declared unviable and the KRWSSA has been set up for this," says Nair. The Rs 450-crore loan makes people like R Shashi, president of a beneficiary group in Ayilur panchayat in Palakkad district, uncomfortable. "What if the state government backtracks from repaying the World Bank? Will the burden then fall upon us?" he asks. Panchayats and opposition parties are against government's massive foreign borrowings. The modernising government programme (MGP), for which the Asian Development Bank (ADB) has given Rs 1,800 crore, is supposed to reform the state's finance and governance, but critics say it will dilute decentralisation. MGP has 100 programmes for policy reforms in 20 government departments. But MGP believes that institutions delivering government programmes to the people have to be improved too. Therefore, 3,000 'service delivery' institutions -- primary health centres, district hospitals, police stations and anganwadis -- will be developed as 'model institutions'. About 70 per cent of these institutions are directly under the panchayats, and so local bodies would be subject to massive reforms. P Kamaluttty, secretary, LSG, says Rs 250 crore will given to local bodies in 2004-05. "External loans were just 1 per cent of the state plan under LDF. Today, it's 21 per cent. Governance by people's representatives is being demolished and a few bureaucrats whom the ADB favours call the shots today," says K M Shajahan, additional private secretary to V S Achutanandan, leader of opposition in the Kerala assembly. " 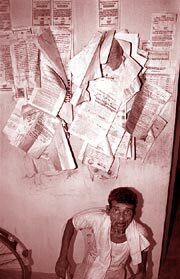 UDF fought an election saying Kerala's debt was Rs 23,000 crore in 2001. Today the debt has risen to Rs. 37,000 crore and they are still borrowing," he says. Under MGP, the state government plans to amend the Panchayat Act to levy a health cess. Also, rules will be brought in for social audit, revenue assessment and human resource management. To panchayats this reeks of privatisation, for which they are being turned into mere implementing agencies. The UDF government has also suggested forming an urban regulatory authority. Its urban policy statement talks of privatisation of services in the future: municipalities should withdraw from being service providers and become facilitators. Isn't this tampering? Chief Minister A K Antony rejects such fears. "When I want to give everything to panchayats there is a problem and if I don't honour their wishes, I am accused of tampering with decentralisation," he says. But to T M Thomas Isaac, LDF MLA and former member of the SPB, "Decentralisation for the World Bank or any other donor agency is downsizing the government and taking away its responsibilities. Yet, four years ago, Shivarajan could approve plans and implement them fast. In five years, the panchayat built 9,051 houses, 5,000 toilets, 360 drinking wells, 20 roads and three mini water conservation schemes. For the first five years, the panchayat spent all its money on programmes decided by the gram sabha. Kerala's first rural research centre on village economy and culture was set up here in 1998. "Local government was emerging as a new culture but it is no more now. People are hardly interested in the panchayat," says S Mohan, who helped set up the centre. "For two years, I have been sitting over a request for 750 houses. The panchayat is no more in charge. The district technical committee delays programmes," says Shivarajan. Down To Earth reported in 2000 that out of 1,000 local bodies, 200 were doing 'very well' and 300 were 'moderately successful'. Now, S M Vijayanand, secretary in charge of planning and economic affairs, estimates hardly 100 panchayats are functioning satisfactorily. "Rest are without power and money," says a senior official. In October 2003, 10 panchayats ousted their president and vice-presidents. C S Vidyasagar, president of Vithura panchayat was one among them. "The reason for my removal was partly political and partly administrative," he says. Vithura may soon be without a panchayat. The state election commission has served notices to panchayat members, asking them to explain why they shouldn't be removed for not holding gram sabha meetings four times in a year. During 1996-2000, Vithura had ensured houses and irrigation for 50 per cent its residents. But now Vithura has been hit by political clashes caused by implementing delays. To ensure accountability, the finance department has asked panchayats to go through guidelines comprising seven clauses and 89 sub-clauses. They also have to be fluent in 150 government orders relating to their power and functions. Each panchayat is required to give a certificate that it is following each guideline. V J Jose, president of the Eerattupettah block panchayat in Kottayam district, discovered that he could allot only Rs 2,000 for a new toilet for a physically-challenged resident, though the cost was Rs. 3,000. "This is what they call decentralisation here," says Jose, a Congress worker, who has written a letter to LSG Minister Cherkkalam Abdullah, criticising the government's decentralisation programme. "The Thalappulam gram panchayat in Eerattupettah wanted to set up rain guards to help marginal farmers, but the block technical advisory committee and district planning committee objected saying it didn't meet the guideline on subsidy," says Jose. "It will take my staff four to five months to complete the paper work," he says. "Panchayats have not been able to complete works on time because of delay in allocating and transferring funds, and poor co-ordination among officials," says a study done by CapDecK last year. People's participation has come down drastically since 1998, says another study conducted in 84 panchayats by K N Hari Lal, associate fellow with the Centre for Development Studies (CDS). BCs, supposed to displace contractors and involve people in implementing projects, have been changed. Contractors and government engineers had joined hands to scuttle them. Today, new guidelines make it mandatory for village panchayats to tender works above Rs 25,000. The intent here may be good, but panchayats are unable to implement works. "We put out tenders for re-tarring roads and constructing water tanks, but no one has replied. Contractors know that they will have to wait for their money," says U K Narayanan, president, Mulamkunnathukkavu panchayat. "Food is served but we have no permission to eat," he says. Earlier, panchayat members managed funds with their gram sabha's approval. But in August 2003, panchayat accounts were put in the panchayat secretary's personal deposit account in August. The secretary, a government official, now signs all expense requests. "Panchayat presidents theoretically control the officials, but only the government can take action against them," says B K Aliyar, former president, Eerattupettah Panchayat. The Institute of Rural Management, Anand, has told the government that such 'dual control of officers' are a hurdle. "People like Isaac told us that there was no need for us to visit Thiruvananthapuram. But now we have to keep visiting the capital to get an incompetent official transferred or removed," says Jose. "My block development officer meets the district collector some 15 times a month. It is because the collector can suspend the block development officer, but we can only recommend action against our secretary," he says. Abdullah told Down To Earth that local bodies have been getting funds regularly for four months. "In fact, the money for October (2003) has already been disbursed," he says. But Mulamkunnathukkavu in Thrissur district, the panchayat has a credit of Rs 15 lakh in its treasury account. "The cheques we issue are cleared only in the last week of a month and even then the government can, and has, imposed a treasury ban," says panchayat secretary Rema Devi. The Area Development Scheme, which gave each MLA Rs 50 lakh, has also hit local governance. " MLAs can arbitrararily decide what to do with their Rs 50 lakh. This has created a power centre against panchayats," claims Isaac. " MLAs demanded this fund during LDF's rule too but we managed to scuttle it," he says. The UDF government's separation of rural development and local self-government departments in 2001 is another setback to decentralisation. They had been merged in 1999 to shut down the district rural development authority (DRDA), which were challenging the DPCs. UDF also plans to revive the DRDAs. Where did LDF go wrong? "The CPI thought that resource persons in panchayats were CPI(M) supporters,"says Jos Chathukulam, of the Centre for Rural Management, Kottayam. "E M S Namboodripad was a strong champion of decentralisation but he never put forth his ideas in a party forum or a document. Maybe that's why CPI(M) has not wholeheartedly embraced the idea (see box: Conspiracy theory, the Left sees red). "The LDF was highly centralised and everything was concentrated in their office," says C P John, member of state planning board. People participated, but the method was 'top down'. Some contend that corruption also became decentralised. Local bodies didn't have enough technical, administrative and financial resources. The bureaucracy refused to cooperate. In fact, officials used the state's coalition politics to their advantage. The CPI-dominated agriculture department refused to cooperate with the local bodies. Ultimately, the LDF gave in: the district collector was made the chairperson of the district level expert committee in 1997, and a retired official chief of the block level expert committee. "This compromise was a turning point," says Chathukulam. "The real fight is between elected representatives and the bureaucracy, not the LDF and UDF. So if that conflict has not been resolved, then how can there be real decentralisation?" says Shaji. Kamalkutty agrees. "Mindsets have not changed at the top. The government is committed, but the secretaries oppose the programme," says Kamalkutty. The UDF says the state's finances were so bad that it had to go in for loans. "Kerala faces an annual fiscal deficit of Rs 2,045 crore," the UDF said in a white paper on state finance after taking over in June 2001. "The government is unable to honour legal instruments drawn on it and the exchequer's credibility has fallen to abysmally low levels," said the paper. Amid this crisis, the state faces its biggest challenge: turning around its economy. The Tenth Five Year Plan (2002-7) is crucial because Kerala has to implement 1,40,000 development plans in 951 village panchayats in three years. Will decentralisation survive this phase? Why did Om Prakash Rawat, the former sarpanch of Mandiya in Madhya Pradesh's Tikamgarh district, vote for the Congress in the 2003 assembly elections after fighting against the state government over control of water bodies? "I supported the Congress because during our fight against the district administration Chief Minister Digvijay Singh promised to help fisherfolk," he says. And why did Badli Bai, who lives in Kakradhar village of Jhabua district, vote against the Congress? Hadn't the state's watershed development mission restored Kakradhar's ecology? "I voted against the party because the government abandoned the mission. I had to leave the village for work," she says. Rawat and Badli Bai were two voters in an election where voter turnout (67.41 per cent) was the highest ever; the Congress went to the polls asking people to vote for decentralisation and development. Even the BJP focused on bijli, sadak and pani. Perhaps for the first time, candidates faced elections on such local issues like a villager's old age pension or a panchayat not getting funds for a community hall. "The elections were a referendum on the Congress's Panchayati Raj and development programmes. People accepted decentralisation but the party's defeat is a message that it must be delivered honestly," says Rawat. Surveys after polls show the Congress lost heavily in its traditional constituencies -- rural, tribal and scheduled caste voters, precisely people wooed with decentralisation and water conservation campaigns. An exit poll by the Delhi-based Centre for the Study of Developing Societies (CSDS) found that electricity and bad roads were two major issues that went against the Congress. As many as 51 per cent of rich voters supported the BJP and from the upper middle and lower middle class, 47 per cent and 40 per cent respectively. At least 38 per cent of rich voters supported Congress and its vote share from the upper middle class and lower middle class was 33 per cent and 30 per cent respectively. The Congress was sure that 2003 would be a repeat of its 1998 electoral success. According to the Election Commission's analysis, a swing of 0.5 per cent to 2.5 per cent in favour of the Congress decided results in around one-third of the seats. A swing of less than 0.5 per cent won 30 seats for them and a swing of 1.5 per cent decided 79 seats . In 1998, such a swing occurred in tribal areas. But 2003 was different. Decentralisation had created a political force in the state's 58,000 villages, but its mismanagement and the tussle between panchayats, janpad panchayats, zila panchayats and bureaucrats had angered people. As Amit Khare , of non-governmental organisation (NGO) Samarthan , says: "When people scrutinised decentralisation , they found they had got no rights." "Congress workers failed to take the policies to the people," says Shyam Bohre, of Bhopal's Academy of Administration. Ajai Singh, the former panchayat minister and son of his archrival Arjun Singh, admits decentralisation could have been done better. "I did my best to carry forward the power given to the panchayats. Yes, I do admit that the devolution of power needs to be further strengthened," he says. Congress-ruled MP became the first state to adopt the Panchayat Raj Adhiniyam. The Adhiniyam was enforced on January 25, 1994, and was amended six times till 2000, empowering gram sahas instead of elected panchayat representatives. Gram sabhas (village assembly consisting of eligible voters) only had advisory power according to the 1994 Adhiniyam, but in 1996 three amendments empowered them to direct panchayat members on all the 29 functions of Panchayati Raj Institutions (PRI). The gram sabha was made smaller and participatory. An amendment in 1997 allowed a gram sabha in every village, instead of a common one for four to five villages. It now had to meet four times in a year, instead of once. Panchayat members were legally bound to seek the gram sabha's direction. Amendments in 1998 further empowered gram sabhas to audit panchayat accounts. In 1999, gram sabhas got the right to recall their representatives (in all, seven have been recalled). In 2001, the government redrafted the Adhiniyam of 1994 in the form of the Gram Swaraj Act, giving people sweeping powers. This new legislation made the gram sabha the nodal governing body and made the elected representatives accountable to it. "The CM's political commitment was clear," says S C Beher, Digvijay's former advisor who is regarded as the father of the state's Panchayati Raj programme. Even as these reforms were brought in, the government had given bureaucrats and politicians space to interfere. This bureaucrat's signature was needed on all papers. This system continued even after gram sabhas took over. Hapless gram sabhas also affected the state's JFM programme. Implemented in 1991, JFM allowed people to manage the forests and give them a share in profits made out of forest produce. By 2001, there were 12,000 JFM committees with 2 lakh members, many of whom had gained employment because of the programme. These people became angry when the Adhiniyam in 2001 put JFM committees under the control of gram sabhas. Under the Gram Swaraj Act, five-year-old JFM committees had to be dissolved and elected afresh by the gram sabha. About 2,500 JFM committees were disbanded in March 2001, but panchayats weren't explained how gram sabhas would run them. As a result, an estimated 20,000 people lost their daily wage. By 2003, some 5,000 committees had been dissolved without new ones to replace them. The government allotted about Rs 400 crore for JFM but the money remained with the forest department. "The CM got the feedback that the money was being spent. His decision January in 2003 to give all forest revenue to the people was based on this feedback," says a forest conservator. For example, in Betul, people protested angrily when JFM committees were dissolved. "We came to know in January 2003 that our committee which had protected the forest for nine years didn't exist at all," says Munji Yadav, president of forest protection committee in Betul's Churni village. Based on the CM's decision in January 2003,. Churni should have got Rs 10 crore from harvested timber. It's still waiting to get that money. "It is true that benefit-sharing modalities has not been discussed with the people," admits Krishna Murthy, divisional forest officer of Harda district. Harda earned a revenue of Rs 35 crore from timber and Rs 60 lakh from bamboo. This has to be shared by the 150 JFM committees, but Murthy is "a bit confused on how to share the money". And confusion is what bureaucrats and politicians have used to corner decentralisation. If sarpanchs feared gram sabhas, MLAs felt threatened by sarpanchs. " MLAs are sore that there is an alternative leadership in districts and blocks. These local government leaders can mobilise people and swing votes," says Yogesh Kumar of Samarthan. This influence is important because turnout in village elections is 80-90 per cent compared to the 50-60 per cent in Vidhan Sabha polls. Despite efforts to protect panchayats from political interference, the power of politicians has grown. In 1981, Lok Sabha MPs were members of one of their district panchayats if their constituencies had more than one district. Now, MPs are members of all district panchayats in their constituencies. MPs are also ex-officio members of any two committees of their choice in the zila panchayat. In Janpad panchayats also MPs are non-voting participants. Similarly, MLAs are members of district zila panchayats and block janpad panchayats, besides being ex-officio members of all janpada panchayat committees, enjoying power to influence decisions at every level. However, sarpanchs and janpad panchayat presidents have not been made members of any standing committee of the janpad or zila panchayats. "This has taken away all the power of decentralisation. Gram sabhas plans but MLAs decides its fate," says Gaur. But politicians weren't going to be satisfied by a seat in panchyats. They wanted absolute control, and district government was what they got. Zila Sarkar -- started in March 1999 in the name of autonomy -- put politicians and bureaucrats in charge of districts. The system was so unpopular that when the present BJP government came to power, it scrapped all district governments. This mode of governing was a modified version of the constitutionally-mandatory district planning committee (DPC). A DPC ideally reviews development programmes in a district, collects plans panchayats and municipalities make and draft development schemes for the district. They usually don't have financial power. In March 1999, MP redesigned the DPCs into a district-level government and gave them enormous power. A minister was made chairperson, the collector its secretary. Calling a DPC meeting, its timing, agenda and recording of minutes depended upon these two. Zila panchayat members were given a seat in the committee but their role wasn't clarified. The district government was not supposed to encroach upon panchyats, but ministers and MLAs took control. DPCs were allowed to spend up to Rs 1 crore on programmes that weren't with zila panchayats. The committees supervised all government departments in the district. The district government had power over watershed development, forest, agriculture, minor forest produce. It guided panchayats in forming and implementing programmes they controlled. "The district government was creating problems for sarpanchs and panchs. The district government was formed to solve local problems but all power was with the district minister," says Khare. "The minister and collector became all powerful and the district panchayat weak. District government became a transfer industry," says Bohre. Says the study carried out by 5 institutions: "Government departments and PRIs had mixed feelings about the DPCs. The discussions in DPCs were political and members derailed discussions with irrelevant questions." Amitabh Singh, of NGO Debate, says even Congress MLAs knew that the district government would be unpopular. "When Chhattisgarh was formed in 2000, the Congress government scrapped the system in the new state," he says. Back to Mandiya village. Its Gram Sabh is yet to convene and the anger against Digvijay Singh is still there. But says its resident Hatiyasi Kewat, "The two schools under the EFS are the best thing to happen to us despite the bad Panchayats." 80 per cent children now go to school. "The new government now has the responsibility to continue whatever good things from the last government," says Om Prakash Rawat. The debate whether the new government will continue with the decentralisation programme and correct the mistakes rages. Politics and the Constitution prevent the BJP government from dismantling panchayati raj. But it's clear that it plans to change the system. "We must reorganise panchayats and their responsibilities," CM Uma Bharti told her first cabinet meeting. Congress bagged 90 per cent of the seats in the 1999 elections to local bodies, but lost the 2003 assembly polls because it mismanaged Panchayati Raj. BJP has learnt from this. "There is no need to dismiss the panchayats now. There will be elections to them according to schedule," says Bharti. With Lok Sabha elections around the corner, Khare and Bohre believe that the BJP government will presently just make cosmetic changes like renaming schemes and altering the constitution of village committees. By dismantling district governments, Bharti has sent a positive message to panchayats. The BJP surveyed 30,000 panchayats just before the assembly polls. The survey's 400-page report will decide the future of panchayati raj. "The state will adopt a swadeshi panchayati raj. It means jal, jungle , zamin, gau and restoring real powers to panchayats." says Govindacharya, RSS ideologue and advisor to the chief minister. According to sources in the RSS, the survey found panchayati raj entrenched and panchayat leaders in support of decentralisation. "The new policy would be to further strengthen these bodies and rethink their responsibilities and financial power," says Govindacharya. Bohre cautions the new government that panchayati raj has not been established because of politicians and the bureaucracy. "The Panchayati Raj Act has been reduced to a subordinate government office,'' he says, "Somebody has to implement programmes, and panchayats can do that more effectively," says Tomar. It remains to be seen what Uma Bharti will do.